To all the happening couples out there, wish you the happiest and the most romantic Valentine’s Day ever. With the sudden drizzle on a Valentine morning, you all must be feeling even more romantic. The air is lingering with a petrichor scent and a pleasant breeze complementing the passionate moods of the couples. What can be better than this unanticipated extremely amorous gift from nature! As Valentine’s Day is finally here, the plans for romantic celebrations have already been put in place; most of the Valentine gifts must have been delivered at your beloveds’ doorsteps at midnight or early morning; and all your appealing clothes must be hanging in the hangers waiting to be worn for that perfect charming looks. Are you the one who has no special plans for Valentine’s Day like a romantic candlelight dinner at one of your favorite restaurants with your Valentine owing to your busy schedules or a long distance relationship? Is this Valentine Day 2019 will be another homely night for you with your favorite wine bottle and TV? If yes, then we are still very happy for you. You can infuse love and romance in your and significant other’s life, and make your Valentine evening a memorable while having a gala time in the cozy and warm atmosphere of home. If you are looking forward to something to cheer up your heart, make you giggle, and wave off the feeling of wistfulness for your sweetheart, watch a romantic movie together that outstandingly portrays every emotion which a heart beholds. Romantic movies can make you burst with laughter, cry your heart out, and filled with happiness when the lovers unite in the end. Somehow, they provide you with all the warm fuzzies. In the nick of time on Valentine’s Day, below are 10 most affectionate movies to watch with your cuddle beloved. Bollywood Movies talking of Pyar, Ishq or Mohabbat!!! One of the best rom-com Bollywood movies, Jab We Met is a laughter ride with the most hilarious and punchy dialogues (Sikhni Hu Main Bhatinda Ki) to make anyone fall in love with it. There is no girl in this world who could not relate to Geet, a Punjabi girl living life on her own terms (the character played by Kareena Kapoor). The movie will keep you and your beloved engaged with the incredible acting skills of all the actors, and the amazing dialogues and songs. A personal favorite for most of us, Two States is a real-life story of Chetan Bhagat talks about people’s perspectives on the inter-caste marriages in India. This romantic movie revolves around the struggle of two central characters, Krish and Ananya, immensely in love with each other but belonging to different communities, or should we say different zones of India. How their families find it difficult to cope with each other’s cultures, but ultimately found solace, in the end, considering their children’s happiness. The direction of the movie will certainly make most of the couples relate to this movie. Another classic movie from Imtiaz Ali, Love Aaj Kal depicts the contrasts between the traditional and contemporary love stories. The movie talks of how love stories before were more expressive and fearless in comparison to the modern ones. It makes one understand that it is only the perspective of finding a soul mate that has changed with time and not the feeling of love. This movie is a beautiful citation of the fact that loving someone immensely does not weaken a person but makes him much stronger. The sudden recovery of Heer from her prolonged illness on meeting Jordan after a long time is a wonderful depiction of the magic of true love. Such is the power of love that it can make the sickest person stand on his feet. The movie makes every lover believe in the miracles when you have that immensely loving and caring person around. Have you ever felt it? This romantic drama is a personal favorite for most of the guys out there. It teaches people that love is never unrequited and it can be easily attained by winning the heart of another person through love and affection. The character of Maddy played by R Madhavan was a game changer for most of the boys as his character makes them believe in the notion of love at first sight with the scene in which Dia Mirza drenched herself in the rain while Maddy was watching her over. Every guy wishes to love her beloved just as he loved Reena in the movie. it is difficult to find such men and if you have one in your life, then hold on to him forever. This romantic movie came into being due to the sentimental dialogue “If you’re a bird, I’m a bird.” from the famous novel by Nicholas Sparks on which the movie was based. This amorous sob story casts the insanely likable actors Ryan Gosling and Rachel McAdams as a young couple who are separated by their social circle. As love knows no boundaries, they still managed to express their deep love for each other. If this is the movie you are going to watch, then don’t forget to keep a tissue box handy. This Hollywood movie needs no introduction. An impeccable love story of Jack and Rose, Titanic movie is a clear manifestation of deep love and care shared by two people immensely in love with each other. 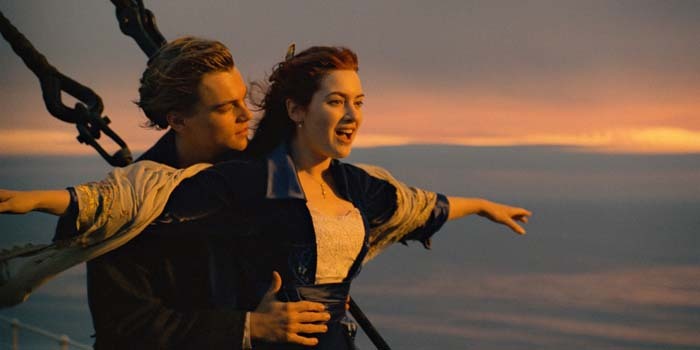 This Oscar-winning paragon of acting excellence by James Cameron, Titanic is not just a monumental technical achievement, but it is also a romantic tale of poor artist Jack and elite class Rose. This Valentine’s Day curled up in your bed with your sweetheart and delight yourself with this beautiful and eternal lover fable. The heart touching tale of a young widow to whom life gives a second chance through the letter from her dead husband is a perfect tale of woe. This movie clearly demonstrates the power of love which doesn’t actually require the physical presence of a person and can make a person’s life blissful through small gestures. An utter depiction of love and sorrow, this movie will make you watch it over again and again. 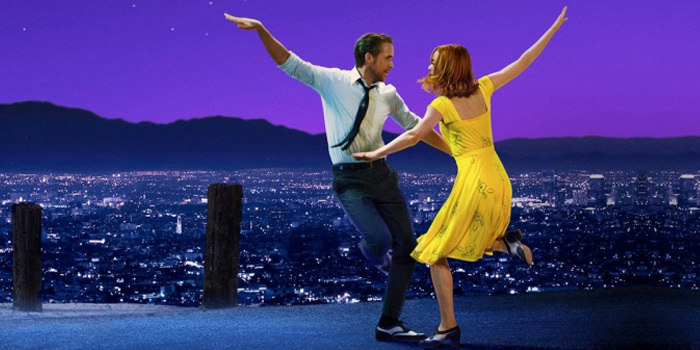 La La Land movie grabs multiple awards owing to the mesmerizing jazz pieces and scenic landscapes that will certainly appeal the lovers who aspire for the fulfillment of their dreams. The movie talks about love, music, and the magnificent blue sky in the backdrop of the city of dreams. There is an actress in beautiful attire and a handsome hero dying to dance. It is an exemplary movie for a romantic engagement. Any movie that stars Billy Crystal and Meg Ryan is certainly a delight to watch alone or in the company of our loved ones. And when it is about celebrating a perfect Valentine Day at home, nothing could be better than watching When Harry Met Sally. The intriguing role played by both the Hollywood stars, this movie revolves around two individuals meeting at different stages in their lives searching for love. And, in the end, how Harry declares his love in an epic way through his words, “I love that you get cold when it’s 71 degrees out. … And I love that you are the last person I want to talk to before I go to sleep at night…. when you realize you want to spend the rest of your life with somebody, you want the rest of your life to start as soon as possible.” is definitely sway most of the couple’s heart.